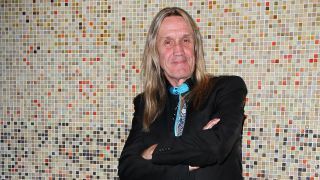 Iron Maiden’s Nicko McBrain has been presented with a special award by the US Navy Seals. McBrain has previously helped raised funds for the Navy Seals alongside his friend, golf long-drive star Mike Zeigler – who also plays bass in McBrain’s band The McBrainiacs. And during a McBrainiacs performance at Rock N Roll Ribs in Florida at the weekend, Zeigler presented McBrain with a Navy Seal ‘fin’ to mark his work with the Navy Seal Foundation. Zeigler says: “Nicko has become one of the family with US Navy Seals. So the guys from Naval Special Warfare wanted to give you a little something. “This is a Navy Seal fin. On this fin is the Navy Seal Trident, the Jump Wings and Freddy The Frog. Iron Maiden's Nicko McBrain: Did I inspire Bruce Dickinson to fly Ed Force One? Rock N Roll Ribs in Coral Springs is owned by McBrain and his friend Mitch Tanne. McBrain and Iron Maiden recently wrapped up a world tour in support of latest album The Book Of Souls. And the drummer said they were so pleased with the album that they discussed the possibility of playing it in full on some of the dates.